I have been meaning to post this entry for a while, but since it is now World Breastfeeding Week, I decided I should stop procrastinating. Back when Junior was born, S developed an iPhone app called Rootn Tootn, which was designed to help mums (particularly, me!) track feeds, nappy changes, sleep, etc. Junior's breastfeeds were longgggg and it was hard for me to spot any patterns, so having a way to record start and finish times made it easier to know when to begin the next feed. You can read about my experience with Junior here. Rootn Tootn allows you to set as many reminders as you want, and you can format them in the settings. The term reminders doesn't encompass every use case. Some things might be an event, like a nappy change. Some events might not need a timer to remind you when it's time for the next one. Some events might not have a start/finish time. Regardless, the settings allow you to choose whether you want a duration timer or not, and whether you need a reminder or not. 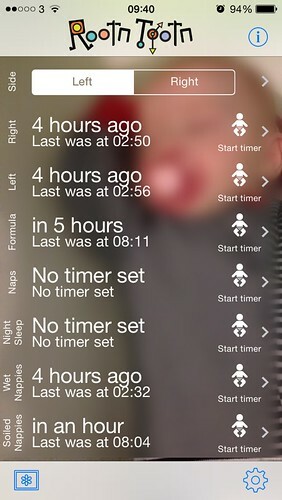 I have seven timers on my screen, although I have not used all of them yet (Juniorette is now 16 weeks old). I decided to separate timers for Right Side and Left Side, although some women may prefer to time each feed (both sides) as one event. I also have an event for formula, since we are combination-feeding Juniorette (more on that in a different post). I thought it would be useful to track events like wet and soiled nappies - we had trouble with Junior's, ahem, output, but Juniorette has been much more regular. Still, I mark nappies when I remember. Eventually, I plan to use Rootn Tootn as a sleep trainer, tracking her naps and overnight sleep. 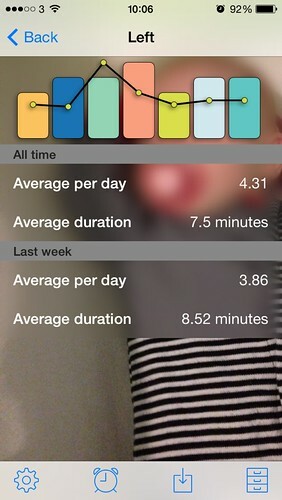 One of my favourite features of Rootn Tootn is the ability to see graphs and averages at a glance. Unlike Junior's marathon 60- and 90-minute feeds, Juniorette's breastfeeds tend to vary between 5 and 15 minutes on a side. I can also track the number of bottle-feeds she does in a day; currently the average is 4 or 5. (I don't always set it when she drinks a partial bottle). You may notice in the screen shots that Rootn Tootn is reminding me that I should have breastfed Juniorette several hours ago. Don't worry - she was fed. 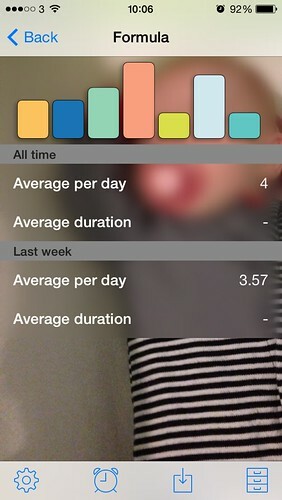 Laziness in using the app each time now that she is 16 weeks old (sorry, S!) combined with better understanding of her patterns precisely due to using the app when she was first born shows that Rootn Tootn accomplished its goal: tracking feeds has helped me know when and how long to feed Juniorette. It's similar to how I use my Fitbit: I don't always hit my daily target but the repetition of tracking has helped me recognise patterns. If your baby feeds regularly like Juniorette, but unlike Junior, you might only need Rootn Tootn for a few weeks or months until you establish your routine. Rootn Tootn is not designed as a substitute for paying attention to your child’s needs. The reminders should absolutely not be the only cue you use to decide whether or not to feed (or change a diaper/nappy, provide medication or whatever other reminders you set). I would expect that, in normal use, you would only occasionally see a reminder. One last feature of the app that might be under-appreciated is the ability to use a photo from your camera roll or photostream as the background image. I chose a photo of Juniorette wearing a dark onesie in order to contrast with the timers better. 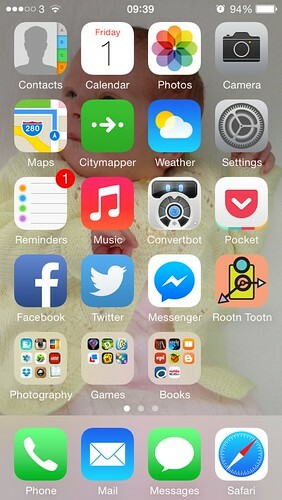 Rootn Tootn is a free app in the iTunes Store, but the in-app purchase features give it the full functionality needed to establish your baby's feeding, changing, and sleep patterns in the early days. While it was developed primarily as a breastfeeding aid for women, it can be used to time anything by anyone: medication, exercise, cooking timers, etc. Rootn Tootn is regularly updated with user feedback. What features would you like to see?